You can decorate a designated area at the office or choose one of the local venues such as a country club, restaurant, or hotel for your holiday party. If you have the party at the company, using a caterer is the best route to take. If there’s enough time, it helps to send save-the-date notices so that everyone can add the party to their calendars ahead of the actual invitation. You want as accurate a count as possible so that notifying invitees more than once helps. Be sure to request an RSVP by a certain date. 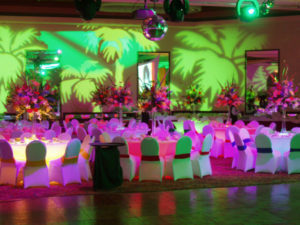 To make your event more festive and fun, it helps to have live music or a DJ. Make sure you have a good sound system and a space for a little dancing if you want to have danceable music. Even if you give small tokens of your appreciation to your employees, giving them out at the holiday party is a great time to bestow cash, gift cards, or any other present you deem appropriate.